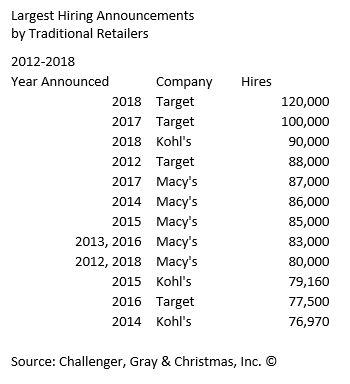 Holiday Hiring Announcements Most On Record | Challenger, Gray & Christmas, Inc.
With Amazon’s announcement that the company will hire 100,000 seasonal workers, holiday hiring announcements this year have surpassed the previous record total of nearly 696,000 seasonal jobs set in 2014. Companies hiring seasonal workers for the holidays have announced 704,000 jobs this season, according to a tally released Wednesday by global outplacement and executive coaching firm Challenger, Gray & Christmas, Inc.
“The competition for seasonal workers is intense, especially as companies expand their compensation and benefits offerings,” said Andrew Challenger, Vice President of Challenger, Gray & Christmas, Inc.
Amazon announced it would increase its hourly wage to $15 per hour last month. According to a survey by Snag reported on in The Washington Post, retailers are expected to increase wages 54 percent over last season. Meanwhile, companies are offering other perks not previously seen by seasonal hires. Target, which announced 120,000 hires for the holidays, the most Challenger has tracked for a brick-and-mortar retailer, is offering gift cards. JCPenney is presenting vacations and “prize packages” to workers, while Kohl’s is offering a special shopping day with discounts for employees. The surge in hiring announcements comes during a period of the highest consumer confidence in 18 years. Last month, the consumer confidence index reached 138.4, its highest level since September 2000, and close to the record of 144.7 set in May 2000. Retailers expect spending to rise 5.6 percent over last year, to a record $1.1 trillion, according to Deloitte's Retail Sales Forecast. That's compared to the $967.13 billion spent last year, according to the National Retail Federation. “Clearly, retailers are expecting consumers to spend more on their family and friends this year. In order to meet this demand, especially in a period of near full employment, retailers, logistics firms, transport, and warehousing are competing for talent and upping their employee offerings this holiday season to attract potential workers,” said Challenger. Source: Challenger, Gray & Christmas, Inc.